Since our last post, we have driven to Broome, parked the yacht with friends, and headed up the Dampier Peninsular for a week of work at One Arm Point Remote Community School. We thoroughly enjoyed the week, largely helping out in Admin with a whole variety of tasks that badly needed catching up on. The school is a happy place to work, with a dedicated crew of teachers and AIEOs. The kids all seemed cheerful and well behaved. It makes a pleasant change. With the school holidays, we drove back to Broome, swapped a few items around in the boat and set up the car for camping. What followed was a quick drive South East along Great Northern Highway to Halls Creek, with only a brief stop at Fitzroy Crossing to catch up with Des and Annette Thornton. Our target destination was Timber Creek, in the NT, where we had a date with a large group all congregating to celebrate a friend’s 50th birthday. From Halls Creek, we took the Duncan Road, a beef cattle road that winds South then East and finally loops back North to crisscross the WA-NT border several times before emerging onto the Victoria Hwy about 20km East of the WA/NT border. The road traverses some very lonely country; we saw no more than 10 people in the three days we spent on the road. Two of the nights we camped completely alone, quite a unique experience in the busy Kimberley tourist season. There are quite a few wonderful spots along the way to explore and camp but in some ways the beauty of the drive lies in the vast open plains we crossed in the Southern sections. Here the knee-high Mitchell grass stretched to the horizon with almost no sign of the coarse Kimberley grass, spear grass or spinifex. The road was excellent, although in places it has probably not been graded in several years. 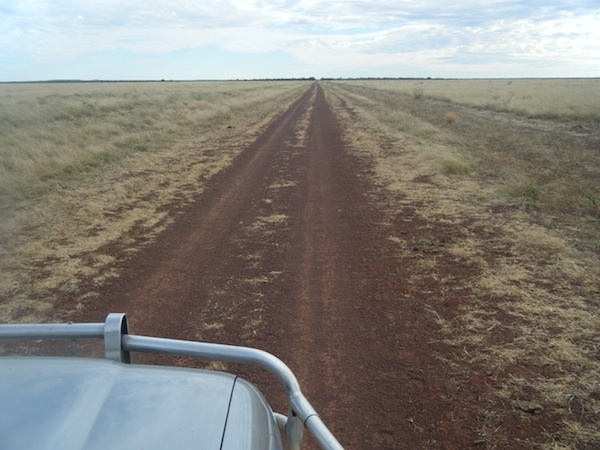 We encountered very few corrugations and even where we could see nothing more than two wheel ruts in the grass, the road was flat and free of rock. Further North, the road winds through a series of low hills and rocky sections or small creek crossings become more common yet still the track is in better condition than parts of Great Northern Hwy around New Norcia. On one stretch, a dingo was asleep in the middle of the road. As we approached, he took off, running in front of us for a couple of hundred metres before finally getting smart and taking to the grass. The bush turkeys (Bustards) were also common on the grasslands. 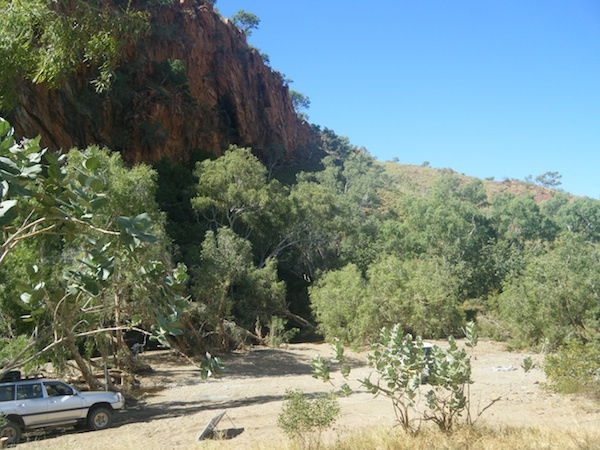 Our first night was spent at Sawpit Gorge, a mere 47km South of Halls Creek. 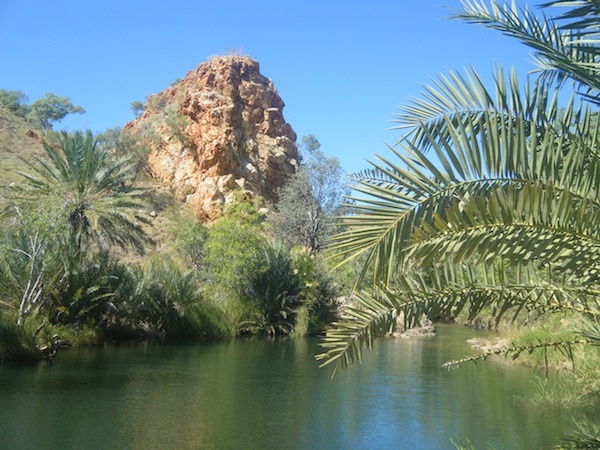 This delightful gap in the Elvire Range has a lovely swimming hole and some spectacular rock formations. Nearby Palm Springs is also a beautiful spot suitable for swimming. We enjoyed the company of two other camps, a Victorian couple and a single guy from Noosa but now of no fixed address. We all got together so well and had a terrific night around a wonderful campfire. The second day we pushed on to Marella Gorge on Nicholson Station. 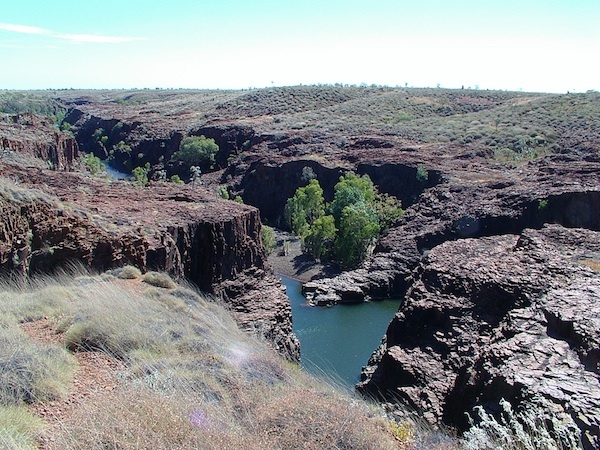 This is is a very large gorge, more like a Pilbara formation when viewed from the top. We were able to access both the bottom of the gorge and the top, allowing us to see it in all its grandeur as well as camp right next to the river. The freshwater crocodiles were numerous on this stretch of river but it didn’t deter us from having a swim. We had the whole place to ourselves, save for the odd kangaroo coming down to drink, the regular howling of dingoes at night and the thrashing of the crocs on the opposite bank. A wonderful spot. On the third day we drove North, stopping to explore the river crossing of the Negri River. This was a strongly flowing river, pouring a lot of water into the nearby Ord. No wonder that Argyle Dam is still overflowing. 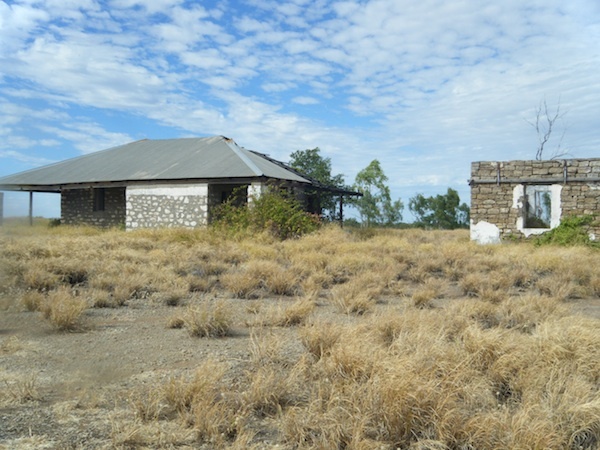 Another stop was at the Old Ord River Station homestead on the banks of Forrest Creek. The stone buildings are rapidly decaying but there is enough still there to get a feel for the isolation and difficulties of earlier times. Our last night was spent at the Behn River crossing. Once again, we swam for a while in the river, relaxed at lot, and soaked up the solitude and majesty of the surroundings. If you want to get away from it all, this is a great place to be. Unfortunately, fishing appears to be a poor option in this part of the Kimberley. Barramundi are out anyway because the rivers and streams are all flowing into the Ord River above the Argyle Dam and Barramundi need access to the sea to complete their life cycle. Strangely, we also failed with Sooty Grunter and Cherabin (freshwater prawns), both of which I thought would have been abundant in these waters. The final morning was an easy drive to the Victoria Hwy then on to Timber Creek for the big birthday bash. We are both envious having experienced the wonderful north with you both last year. Your blog certainly captures all those wonderful moments and places. Enjoy, enjoy, enjoy! What great pics you guys. I am taking two weeks LS leave and Parry and I are heading to Kal then up to Sandstone etc for a bit of a look around. Parry is keen to see the effect of the rain in that area and I just want to sit out under the stars with a campfire and wine in hand. It looks like a lot more fun than sitting in Perth with the flu.